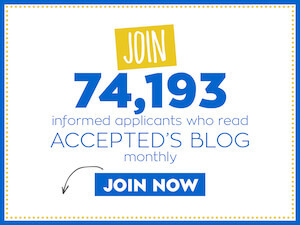 Unless you’ve been in an MBA admissions cave or have your head buried deeply in the sand, you’ve probably noticed that MBA application essay word counts are on the decline. Instead of 500- or 1000-word essays, many applications limit essays to 250-400; some provide guidelines measured in characters, and one (Columbia’s goal question) is shorter than a tweet. Follow this series on our blog or download our special report to learn the tips and tricks needed to focus on the critical and trim your essays down to the limits, without sacrificing valuable content. • Test scores and grades: This data offers straightforward facts about your academic capabilities. They separate the academic brains from the academic bottoms. • Resume: Your resume or CV (or job history on the application) highlights your professional accomplishments and contributions. The key word here is “accomplishments.” Focus on achievements and successes and not just descriptions of your responsibilities. • Non-professional activities list: Similarly, this part of the application showcases non-professional achievements, initiatives, and commitments. Remember: MBA programs want multi-dimensional students who take initiative and prudent risks. They do not want nerds, automatons, or grinds. They want contributors with impact. • Essays: The essays in your application puzzle reveal your motivations, character, and insights. They offer the adcom a window into your subjective perspective. They provide you with an opportunity to dive deep into a few specific, seminal experiences. • Short answer and optional questions: These supplement and complement the above material (which should, in turn, complement each other) with minimal duplication. Make the most of them! They are opportunities, not throw-aways! When you’re dealing with a relatively short application, each element is weighed more heavily than in a longer application. Don’t ever neglect one section in the hope that a stronger other section will make up for your sloppiness or lack of detail. Each component must be thorough and complete, for without even a small part of one section, the adcoms will miss out on an integral part of your personal puzzle. They won’t receive the full introduction and will therefore be more likely to pass on your fragmented introduction in favor of another applicant’s incisive portrait. Pay attention to detail; make sure you address each component in its entirety; and work to provide the most vibrant and accurate puzzle pieces for the admissions committee to put together as they meet you through your application. 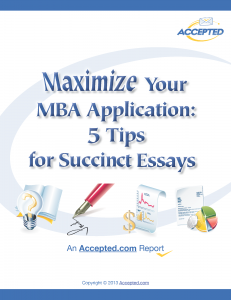 This post is excerpted from the Accepted.com special report, Maximize Your MBA Application: 5 Tips for Succinct Essays. To download the entire free special report, click here.